On an episode of Top Chef Masters, chef Hubert Keller prepared a dish called baeckeoffe, an Alsatian baked stew. It had an interesting back story and I decided to try making it. 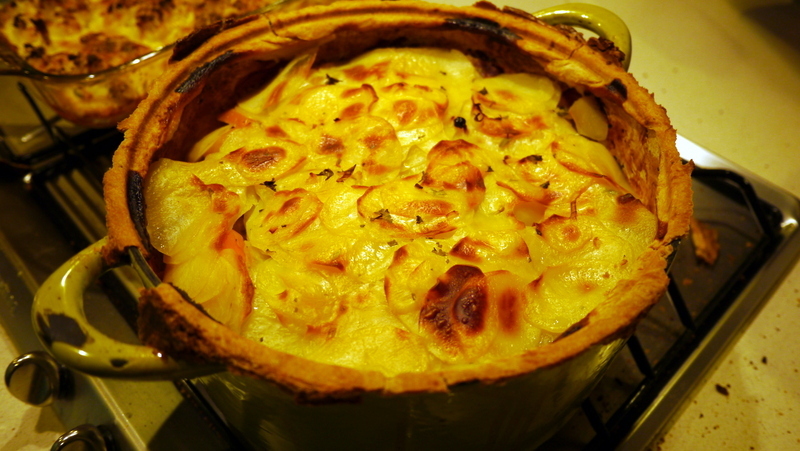 As he explained it, baeckeoffe, which means “baker’s oven” in the Alsatian dialect, was a traditional dish prepared on Sundays by the women of the village. They would marinate meats and potatoes overnight in white wine, juniper berries and herbs. On Monday morning, which was washing day, the women would drop their ceramic pots of baeckeoffe at the baker’s who would seal the lids with a strip of dough and then put them in the oven after he was finished baking the bread. The women would return after a day scrubbing clothes in the river and pick up the cooked caserole. While the traditional recipe includes beef, pork, and lamb, I made mine with only pork. I then brought the caserole to my friend’s house and used her oven to bake it. The video showing the breaking of the bread seal and the opening of the pot is above. The opening was more of a challenge than I had expected. The end result was very fragrant and the meat was tender. The bread seal was flavorless, though, and overcooked. As I understand it, though, it was never meant to eat; instead, it was designed to provide a tight seal to hold in all the moisture. 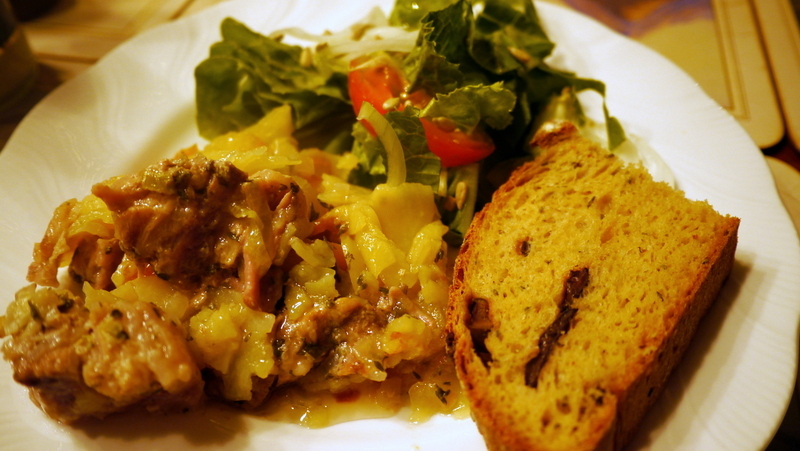 A serving of pork baeckeoffe, salad, and homemade black olive and rosemary bread. Tasty meal! This entry was posted in Uncategorized and tagged Alsace, Alsatian, baeckeoffe, cooking, food, hubert, keller by christao408. Bookmark the permalink. Oh, that looks yummy. I sometimes crave these kind of … stews. But the weather here is not too inducing for such heavy, warm food. I thought you misspelled “bake off”. I was ready to pounce on ya… This is very interesting. I have never tried cooking with juniper berries. Does it leave a very strong aroma? Fall is here now so I’m gonna start making stews again. It must have taken a bit of effort cleaning the pot. Oh that looks wonderful. Yum!!! 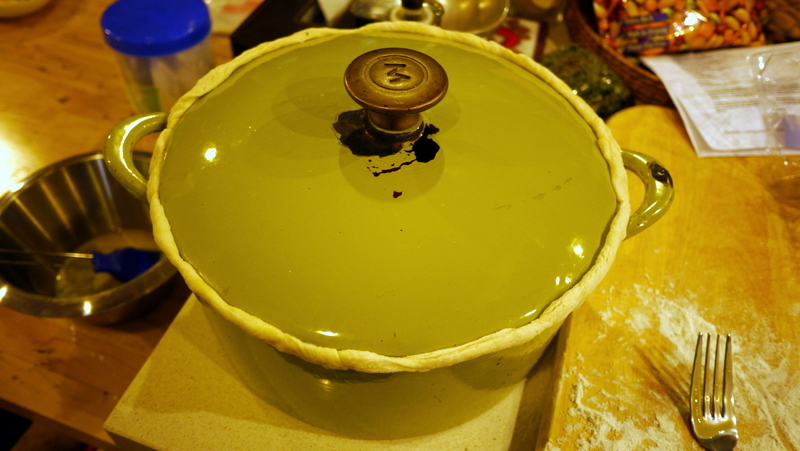 The cooks at home used to seal some pots with a strip of dough to keep the moisture in and to cook the meats well. The strip of dough would be very thick, and so it was easy to peel it off when the time was done. There were no ovens ans so the dish would be placed on a wood burning stove. Interesting dish and combination of ingredients! Looks delicious. Not sure I want to try this one. that looks nice and hearty… definitely sounds like the perfect fall meal! it looks wonderful! yeah, the bread seal isn’t really made to be eaten at all, it’s just to seal the pot tightly so all the moisture doesn’t escape. you’re supposed to use the same technique for poule au pot, but i just put a piece of foil under the lid of the dutch oven and it does a pretty good job of trapping everything in. A great dish. The lamb and beef do add something, especially the lamb. Experiment with other seasonings and veggies that don’t get too soggy form long cooking. I am looking forward to making it again in a month or so. That sounds like a casserole version of what shepherd’s pie is. Yum! Gotta remember this one. So it’s a sort of casserole then? Or more like a stew? @icebladz – Actually, I do have a youtube channel for my cooking as well as for other videos: http://www.youtube.com/christao17. I guess I could create a separate channel just for cooking, though. @secade – Thick like a stew, but not that different from a casserole. @n_e_i_l – Yeah, if it was just mashed potatoes on top instead of sliced potatoes, it would be very similar. @Toro69 – Agreed that additional meats would make for a more robust flavor. Lamb is pricey here in Thailand, so that’s why I skipped on that, and then Tawn doesn’t eat beef, so I was left just with pork. You know, another option would be to make it with beer instead of wine. That might be tasty! @kunhuo42 – The thought crossed my mind that some aluminum foil might be sufficient, but the idea of using dough was very appealing. Great effect with the unveiling, too. @iskrak – @beowulf222 – It is a very appropriate dish for the cooler months. Except that in Thailand, I have to really turn up the AC to create an autumnal effect. LOL@Fatcat723 – I think you could bake a smaller, simpler version of it and, as Aaron suggested, just use foil to seal the pot. @ZSA_MD – Ah, so it is a widely used idea, then. The recipe made only a small amount of dough, but you are right: if I made a wider strip of dough, it would more easily peel off. @ElusiveWords – @Inciteful – The juniper berries add a nice aroma that is reminiscent of rosemary but maybe more citrusy. The batch I have are a few years old; probably time to throw out and buy new ones. @rudyhou – @I_love_Burma – @Grannys_Place – Thanks for your comments. The dish turned out very tasty.